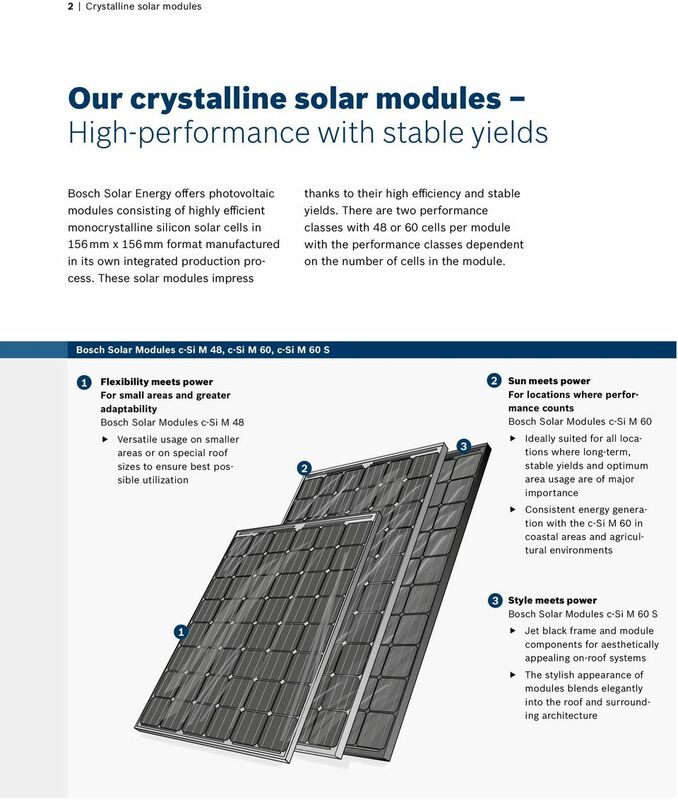 Download "Crystalline solar modules by Bosch Solar Energy"
4 4 Crystalline solar modules Our products Everything from a single source New production processes and the next product generations are developed at the Center of Expertise and main plant for crystalline photovoltaics in Arnstadt, Germany. 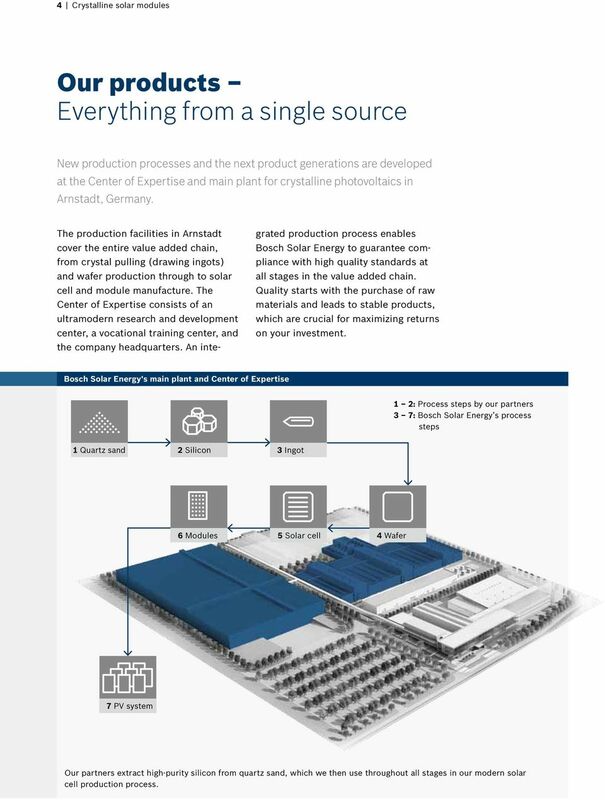 The production facilities in Arnstadt cover the entire value added chain, from crystal pulling (drawing ingots) and wafer production through to solar cell and module manufacture. The Center of Expertise consists of an ultramodern research and development center, a vocational training center, and the company headquarters. An integrated production process enables Bosch Solar Energy to guarantee compliance with high quality standards at all stages in the value added chain. Quality starts with the purchase of raw materials and leads to stable products, which are crucial for maximizing returns on your investment. Bosch Solar Energy's main plant and Center of Expertise 1 2: Process steps by our partners 3 7: Bosch Solar Energy s process steps 1 Quartz sand 2 Silicon 3 Ingot 6 Modules 5 Solar cell 4 Wafer 7 PV system Our partners extract high-purity silicon from quartz sand, which we then use throughout all stages in our modern solar cell production process. 6 6 Crystalline solar modules Warranties for you and your future Thanks to our meticulous development process, an ultramodern production system and extensive testing, we are able to offer end customers the following warranties for Bosch solar modules in addition to the contractual warranty provided by the respective vendor. 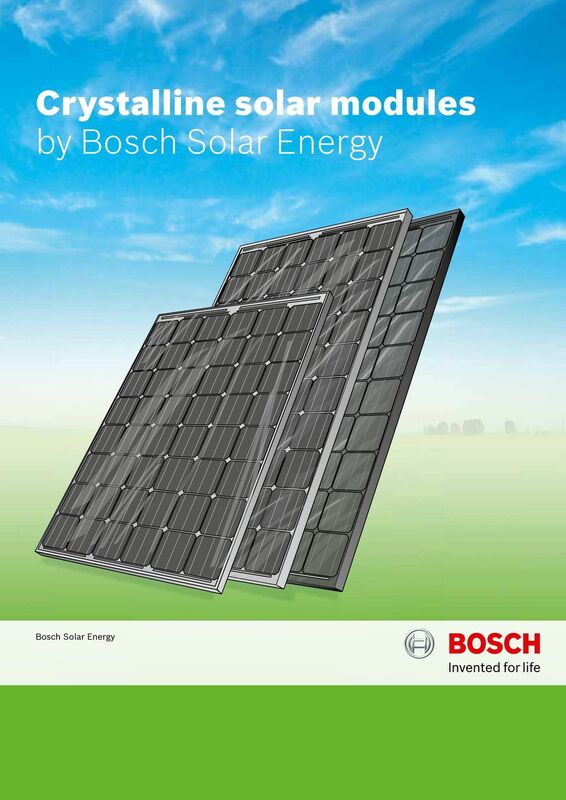 Product warranty*: Bosch Solar Energy guarantees that purchased modules are free of material and processing defects. 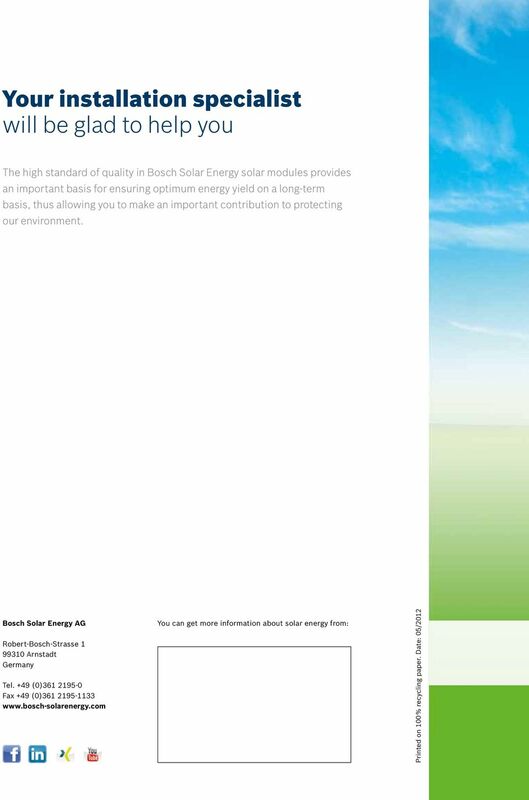 Warranty period: 10 years for crystalline modules. 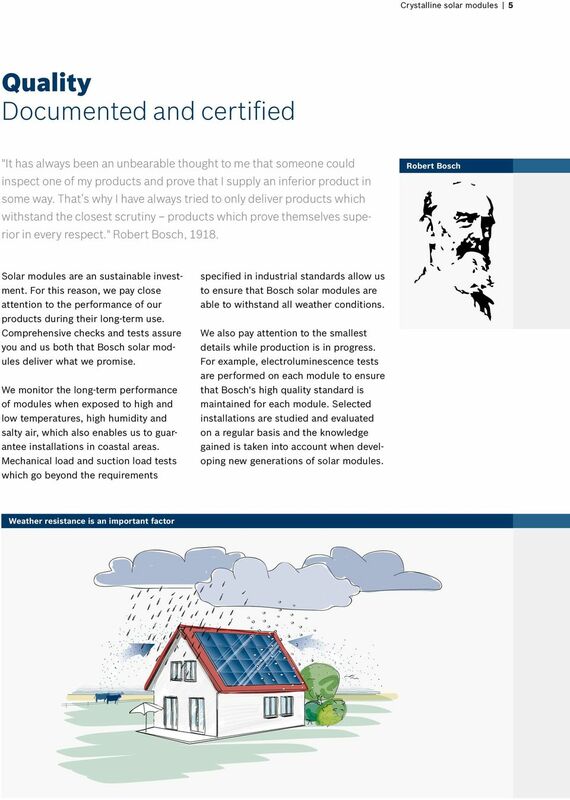 Performance warranty*: Bosch Solar Energy guarantees that modules achieve the minimum output specified on their data sheet. 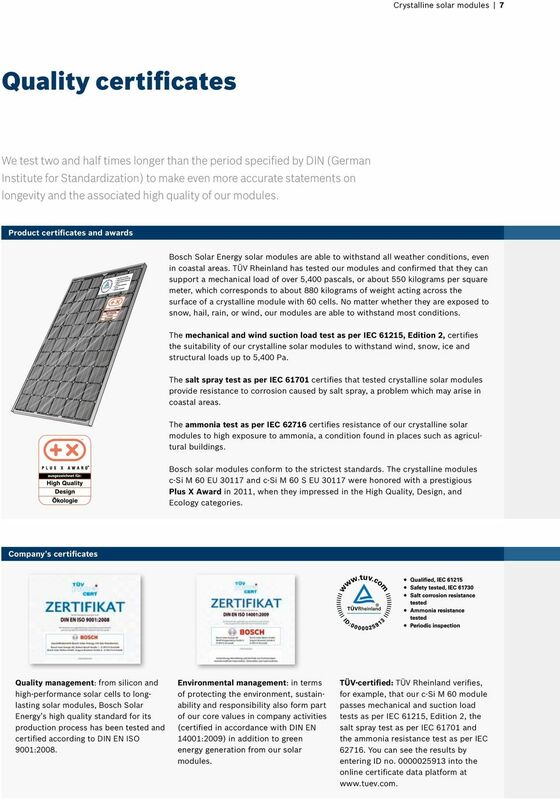 Warranty period: in the case of crystalline modules, we guarantee 90 % of the specified minimum output on the data sheet for 10 years and 80 % for 25 years. 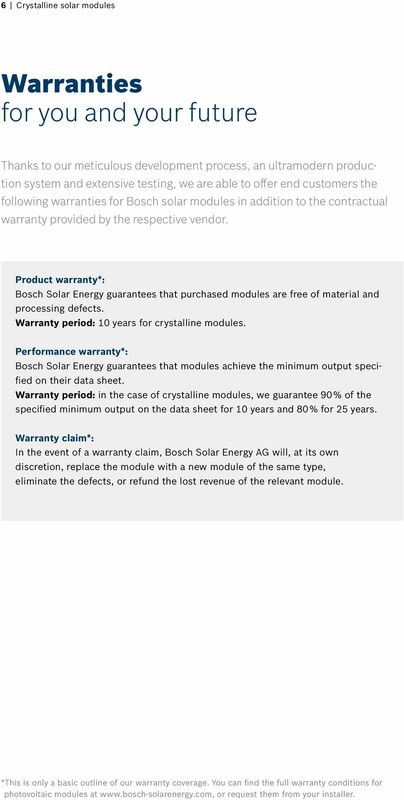 Warranty claim*: In the event of a warranty claim, Bosch Solar Energy AG will, at its own discretion, replace the module with a new module of the same type, eliminate the defects, or refund the lost revenue of the relevant module. *This is only a basic outline of our warranty coverage. 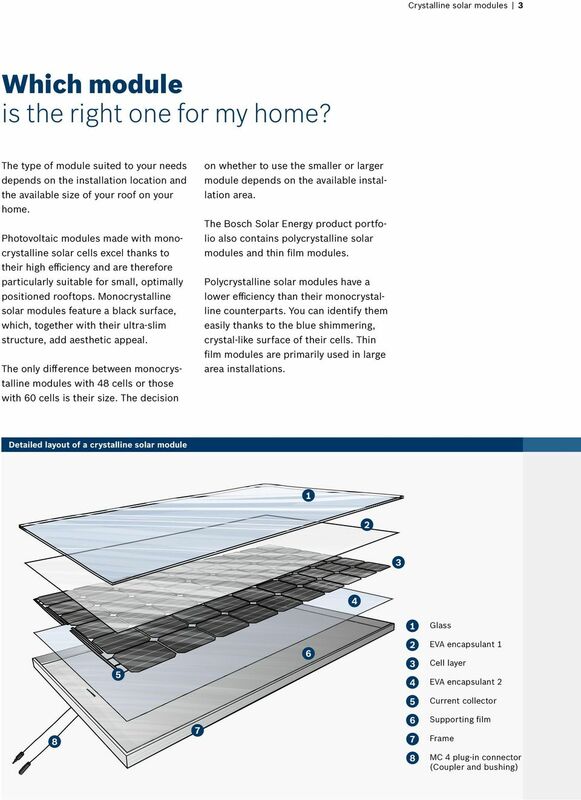 You can find the full warranty conditions for photovoltaic modules at or request them from your installer. Vision and Mission. Mission: Provide one-stop solution of clean energy and become industry leader. The document was not produced by the CAISO and therefore does not necessarily reflect its views or opinion. 5th World Conference on Photovoltaic Energy Conversion, 6-1 September 21, Valencia, Spain THE IMPACT OF YIELD STRENGTH OF THE INTERCONNECTOR ON THE INTERNAL STRESS OF THE SOLAR CELL WITHIN A MODULE Y. Real Value the solarworld standard Our commitment to Quality SolarWorld I Quality solarworld.com "In the U.S. and every solar market around the globe, we are building the solar world of tomorrow, today." Thin Is In, But Not Too Thin!